to Huffy. They all look like ramshackle rusty junk...sit outdoor all the time. But they seem to ride pretty nice, even with all that rust. Some feel pretty comforable...some feels really awkward and uncomfortable. If you're a bike snob and you had $1000 to spend on a Cruiser for multi-purpose use that's durable and relatively light weight, what would it be? Something small for a 5'7" person. Last edited by mtb_addict; 01-19-17 at 08:17 AM. Bike snobs don't usually opt for cruisers... probably because they view them as "ramshackle rusty junk". Those inclined to own a relatively lightweight and durable cruiser usually build their own. Who makes high end Cromo cruiser frame? I am build a commuter...so I prefer comes with fender and big chain grease/leg guard. And there's a lot sidewalk riding to be done...and they are rough expansion cracks everything...so cushy tires. I'd get a Worksman Low Gravity just because I think they look cool. I don't know how they'd do on the little hills in my neighborhood though. I'd just get a 29er cruiser from Walmart. Cruisers can only be so good. Paying more won't necessarily get you more since they defy road/mtb bike practices. Expensive cruisers are usually specific to someone's taste, that or they just look cooler. With the Walmart bike you can replace stuff as you go along. I'm converting the Millenial into a fixed/single speed Cargo with rear racks and front porteur. I bought it because it was spaced 120 in the rear, had massive tire clearance, was fairly light and had mounts for everything I needed. That and I thought it'd look cooler than one of the off the shelf "fixies". this would be closer to my thinking (I even have a couple of those millenials too, but they're going in other directions). from the way the op is writing I'd guess he'd want a hybrid, then add seat, bars, etc. to make it as close to a cruiser as he wants. 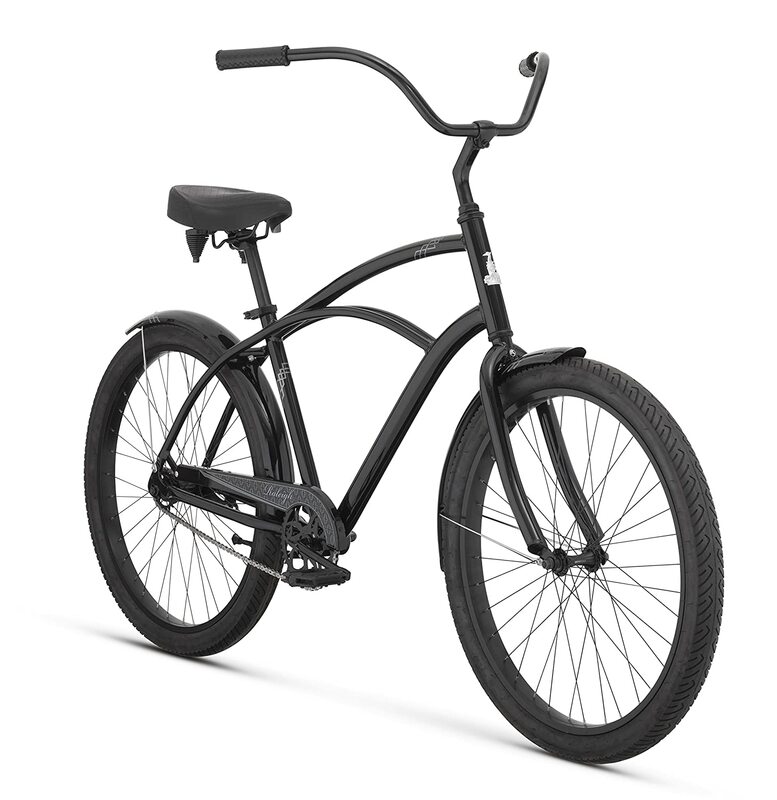 For me what sets a cruiser apart from other bikes is the frame... swooping curves and the ability to accept wide tires. I have single and multispeed cruisers with ergos similar to my touring bikes, bars at about the same level or slightly below the saddle top so in a traditional sense they don't conform to beach cruiser standards. 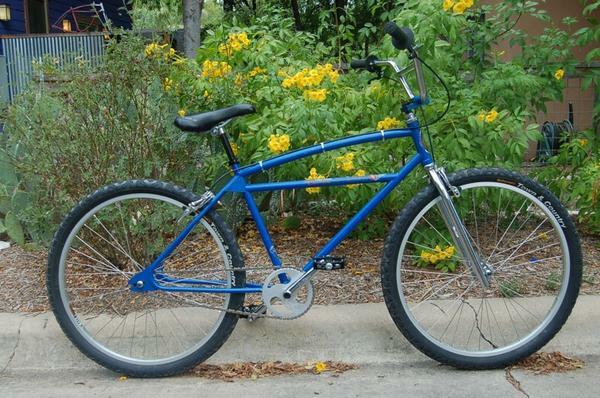 If I were inclined to build a higher-end cruiser I'd base it on a Santa Barbara Cruisers 4130 double butted chromoly Cook Bros Racing style frame. Cruisers modeled after board-track and flattrack racers is what I like. Last edited by BassNotBass; 01-24-17 at 10:10 AM. The higher quality lines like Felt, Giant, Electra consistently have the same specs. They are lightweight, alloy rims. Their designs are pretty flashy in some cases. The highest price I saw so far is around 800. These are the high end cruisers. Huffy imo has the cruiser line. Many models, very low pricing, pure Chinese quality but backed by Huffy customer svc....Their designs really go back in time and really do make a decent bike for the common individual. I have two felt 29er frames as single speeds, New Belgium Brewery bikes. I've had other felts with the big top tube and 26" in the past and a schwinn, but the 29ers are my favorite. (which is why I have two). even the felts have started to creak from the bottom bracket after 400 miles though. ... even the felts have started to creak from the bottom bracket after 400 miles though. When bottom brackets with ashtabula cranks end up creaking it's usually because of a loose chainring. The stationary cone ends up backing off because most contemporary cranks have an undersized drive pin which doesn't fit tightly into the chain ring's drive pin hole allowing the chain ring to slip back and forth during alternating pedal and braking cycles. Of course this only tends to be a problem with bikes that have ashtabula cranks and coaster brakes... my bikes with ashtabula cranks and free spinning hubs have never creaked. 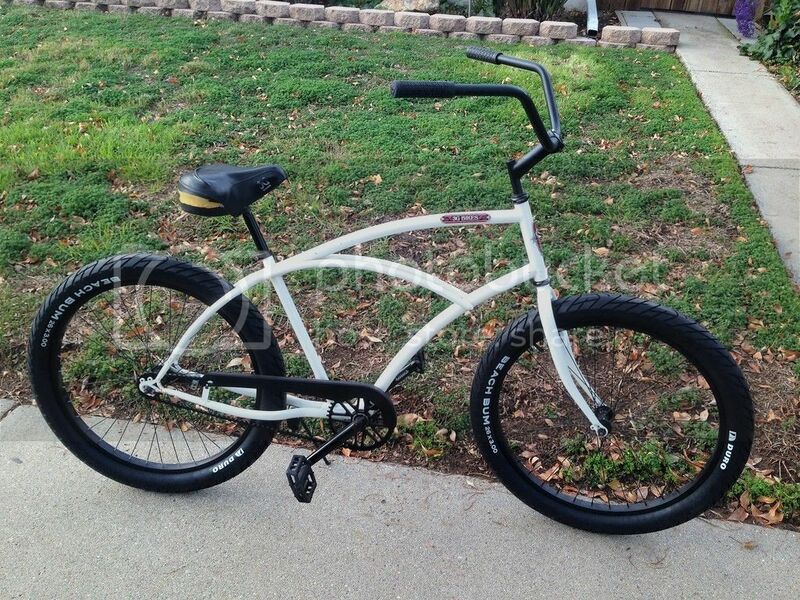 I see a CL vintage Murray cruiser for sale for $100...looks mint from the picture...can't see any rust. Owner says it's made in USA. It has white wall tire, and it has "Westpoint" on the frame. Does this bike has good component? A good frame? Is this better quality than the mass produced China bike? That's pretty high if you're not a collector. Expect it to be heavy with a one piece crank that takes 1/2 pedals. As far as cruiser bikes go Made In USA isn't necessarily better than Made in China, especially if it's over 20 years old. Even if it looks mint it'll probably need to be worked on. Nice bike though. My opinions on from a commuters point of view. Beach Cruisers can weigh around 40 pounds. My heaviest road bike is 31 lbs and I'm sick of it lol. It only has one gear and I live around a s(*& of hills though. I have a westpoint in pretty decent shape. I think I paid around $40 for it. it's pretty much just a regular beach cruiser frame. I wouldn't pay any where near $100 for one. I'd check some flea markets and thrift stores. I just brought three over the weekend (including another huffy 29er cruiser). didn't pay $100 for all three together. Most Cruisers have curved frame tubings. The curves usually seem unnecessary to me. And proby weighs alittle more than straight tubes. Is it that curved tubings are more flexy...hence give a smoother ride? Or is it just for style? Last edited by mtb_addict; 02-07-17 at 01:54 PM. Yea the frames are really a style thing. Its one of those things that set the cruiser apart. Idk I am getting close to buying my next one now that Spring is getting closer. I can at least say ive done my research to the point where I almost know what lines are making changes for 2017/18 lol.. But Huffy has those styles and I can honestly say never has one disappointed me. And if it did lol. I didnt spend a lot lol. So I think I am going to add another to the fleet, not sure which model they have several. I can appreciate those who do find these old bikes and restore them. I plan on looking at garage sales when they pop up. If I do I will restore one. But for the next buy im going huffy lol.. I think its what im most comfortable with....And thats what its really all about lol.. I've been on the look out for something older than me but of course that means the seller wants top dollar for a POS just because it's old. I would love to pick up a 1930s-1950s era 'cruiser' with an old Bendix or Morrow hub. Maybe check out 3G's website? They have a lot of variety. I have a couple with the forward bottom bracket position frame and it is the most comfortable bike I have ever owned. Last edited by 805Speed; 02-19-17 at 03:57 PM. Actually any bike or trike can be a cruiser. Unlike so many of the "real cyclist" seem to think it is not mandatory to ride with your head down as fast as you can. Stay away from wal mart cruisers. Bought my wife a Schwinn Fairhaven a few years ago. Cantankerous heap that weighed a ton. Traded it in at the local bike shop for a Jamis Earth Cruiser 3. It's aluminum so it's very light. Has the Smimano Nexus system so no shifters and derailleurs to worry about. Although it's only 3 speed, those three gears more than get the job done. Has a coaster brake but you can easily add a supplemental hand brake. Almost wish I'd bought myself one as a knock around bike. This is very true if the user doesn't now how to set up a bike. I have both an Electra and Schwinn Heavi Duty (did I spell that right?). I like the old schwinn with it aluminum wheels for the old cool factor, but the Electra is lighter. Both are single speed coaster brake bikes. Cruisers are about style while getting around. Those all look very nice, just wish they still came with the older style forks. That would perfect the look!